This 3 light vanity highlights crystal accented shade to match glam decor. . The fixture is finished in polished chrome which matches most home styles. Bulbs are included ready to install. Requires 3 - 60 watt G9 bulbs included. Add a little flair to your home's decor with this crystal and linen hanging pendant light. The black banded fabric shade with a squared nickel finish offers a stunning transitional look, while the open drum shade provides for extra light above and below. A hardwire installation is required but all instructions and hardware come included to make things easier than ever. Lighting strip perfect above and around bath or dressing area make up mirrors. Use with standard base G25 bulbs in frosted, clear, or color. Suitable for damp locations. Perfect for bath, kitchen, and service porch areas. Rounded polished chrome frame adds a mirrored reflection. Halogen bulb behind crystal shade cover diffuses light and varies illumination. To change bulbs, remove bottom finial button. Halogen bulb(s) included with hardware and installation instructions. Compliment your bathroom or any bedroom with Eglo's Vicino LED 3L vanity light. Eco-friendly and certified Energy Star, not only will the fixture decorate your space, it will help you lower the electricity bill. 2L and 4L models are available to complete any decor. 3-Light Chrome and Crystal Vanity Light Fixture This 3 light vanity highlights crystal accented shade to match glam decor. . The fixture is finished in polished chrome which matches most home styles. Bulbs are included ready to install. 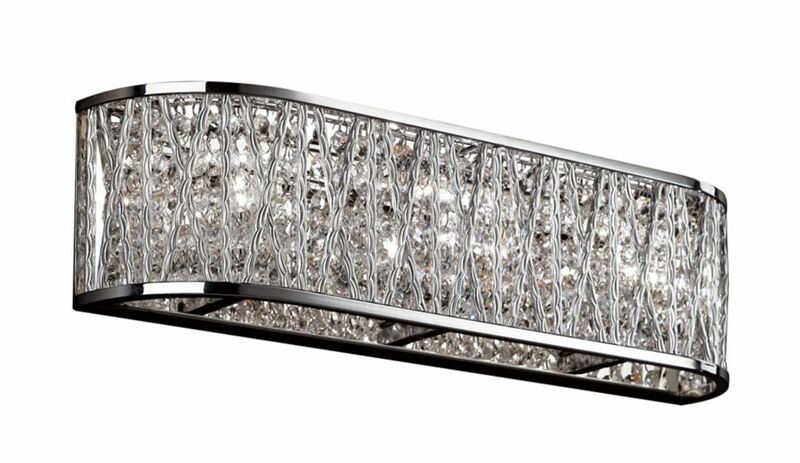 3-Light Chrome and Crystal Vanity Light Fixture is rated 5.0 out of 5 by 1. Rated 5 out of 5 by TinaM from Stunning!! We bought this light to for our Ensuite and with the new granite and glass tiles, I knew instantly it was the perfect light to compliment our space. I am pleased with my purchase. The only thing I should have done different was order a 4-light rather than the 3- light. As you see by the pic the 3 is not quite wide enough. Our Medicine Cab is 7.5" deep, that's why the light looks so small. The light is even more stunning in person. The pictures on website and even mine, won't do it justice. Can this be mounted vertically along the side of a mirror? Hi Jay, yes, it can be mounted vertically or horizontally.